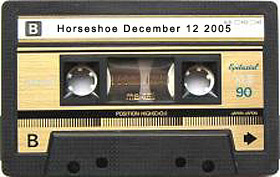 Details: The Rheostatics, live at the Legendary Horseshoe Tavern in Toronto, December 12, 2005. Ford Pier on keyboards. This was the 5th show of their 10 night Fall Nationals run at the Horseshoe. 8 track files provided by Steve Clarkson - mixed by Darrin Cappe with a bit of track specific compression, gain, limiting and slight reverb to drum and vocal tracks. The entire audio had a major sound issue part way through The Land Is Wild and into Superdifficult. I used a Mark Slogget Soundboard mixed track to bridge the glitch. Better than just cutting it out.